Now that we’ve had a nice long weekend of gentle soaking rains that were much needed, we can get our mowers tuned up because mow season is in full swing!! Never remove more than 1/3 of the entire leaf blade per cut! This post will be short and sweet. When you mow your lawn this season, make sure you never hack off more than 1/3rd of the total leaf blade when you mow. Set your mower deck so it is cutting the grass to a height of 2.5″ – 3″. How do you do that you ask? Just make a test cut on a section of your lawn, measure the height of the grass blades. Take a measuring stick and set it onto the soil surface. See where the majority of the blades fall within. If they are under 2.5 inches then raise the deck a notch and test again. Your goal is in between 2.5″ to 3″. Once your cut height is within that range, you can begin mowing your lawn. Each time you mow alternate the direction you are traveling. Also, mow at the growth rate rather than the calendar. If you consistently mow at 3 inches, wait till it gets to around 4″ and then cut it back. Don’t let it get to 5 or 6 inches before your cut. You will remove too much of the blade and cause it to yellow and rob energy from the roots! Be nice to your lawn and mow regularly. If you keep to the 1/3 rule then you will never have to bag clippings again. It’s always better to return the nutrients back to the soil. However, it’s not always an option to mow at that frequency. In the spring time, you may be mowing 2 to 3 times per week. If you let it grow taller and don’t have time to mow it as you should then raise your deck before mowing. Give it a couple of days to bounce back after you mow and then drop the deck down again. Just don’t scalp your lawn, what ever you do!!! One other tip, make sure you sharpen your mower blades twice per season. Once in the spring and once half way through the summer. Dull blades make rough cuts and disease easily gets into the grass that way. Just remember this simple tip. When your lawn turns brown it needs water! Just like all the plants in your home and gardens, your lawn needs water as well. If you deprive it of that then it will fall prey to disease and possible insect damage. This summer when the heat turns up make sure you have a few sprinklers ready to help things out. Water for a long time, not a short time. Your goal is to drench the soil deeply so the moisture gets down to the roots. That means water in the early mornings ONLY and do it in each spot for around 45 minutes to 60 Minutes. If your lawn browns out then you can revive it easily by doing this. Another important tip is that your lawn should receive around 1 1/4″ – 1 1/2″ per week in water! That should be all you really need to know to take care of your lawn for the summer ahead. 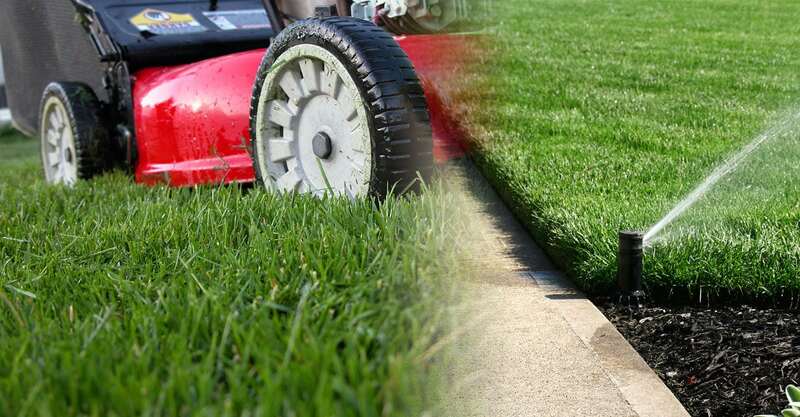 Remember, we can provide the nutrients but you need to care for your lawn by mowing and watering properly.